These baked chicken wings are tasty and juicy with fragrant lemon aroma. Whenever we have chicken wings for lunch, dinner or snack time, my daughter would never have enough. One of my friends even screams out, “Chicken wings, I love you.” , when any wings are on table. I don’t know if chicken wings have got any magic. 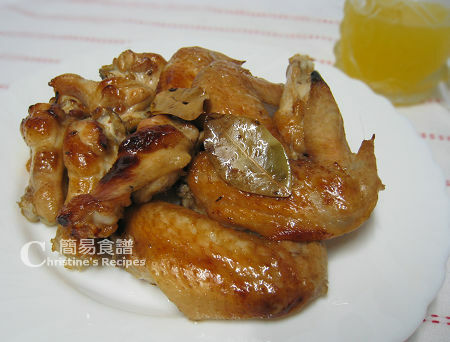 Last week I baked chicken wings with honey and lemon juice. Preheat oven to 200C (392F). Rinse chicken wings well and pat dry with paper towels. Cut into pieces. Marinate for at least 30 minutes. Place chicken wings in a ceramic baking pan in a single layer. Drizzle lemon juice. Cut reserved skins into quarters and add to pan with bay leaves. You might like to drizzle over olive oil as well. But I didn’t use any oil as the chicken wings will release heaps of oil while baking. Bake for 25 to 30 minutes until cooked. Turn once after baking for 20 minutes, basting with sauce. Brush with honey on the surface of the wings when almost done. You’ll notice a layer of oil over the sauce in pan, just use a teaspoon to remove the oil. Serve wings on a platter at room temperature. Transfer sauce in a small bowl for dipping or just pour over the wings if desired. If you don’t want any sauce and get the BBQ effect, use metal baking pan instead of ceramic one. You can add more lemon juice and honey to your preference. Oh my gosh, this just looks so good with that savory sweet sauce. I know I would love this, not to make it. Send them my way please!! What a delightful meal!! Yummie!! I just gave you an award & I wrote about yours!! Please come over @ my foodblog & pick it up!!! It seems that the savory sweet sauce has got some magic in it. I also long for coming back to HK to visit my family and friends. No problem as long as the technology could do this job for us. Congrats! You're really liked by many bloggers. I love your blog too. i'm lost! when should the lemon juice be added: step 2 (marinate) or 3 (transfer to pan with lemon skins)? 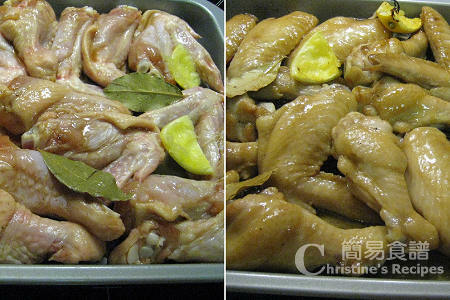 The lemon juice is added when the chicken wings are placed in a baking dish (step 3). Do you think it will affect the taste/aroma if I omit bay leaves? Thanks. It won't affect the taste. But the wings will have less aroma. Thanks Christine! This dish is easy and I am going to cook it for my family. I am so loss as to what to cook these days. You can get them from any supermarkets or Asian grocers easily. All oven temperature assigned in each recipe is without fan. If with fan-forced, it'll be specified. Hi Christine, can I use chicken drumsticks or thigh for this? Thanks! Sure, you can. Just adjust the baking time accordingly. Hi Christine, I noticed your recipe mentioned a sauce that goes with the wings? Is it the marinade? You're right. Put the marinade with the chicken wings and bake them together. There will be some sauce/juice released after baking if you use ceramic baking dish. If you use metal baking dish, the juice will be boiled away very quickly.